Radisson Blu Resort Fiji Awarded Number 1 Family Resort in Fiji for 2018. The Radisson Blu Resort Fiji has continued its popularity with families after being proclaimed winner of the Number 1 Family Resort in Fiji. This was through the reputable Trip Advisor Travellers Choice accolades for 2018. 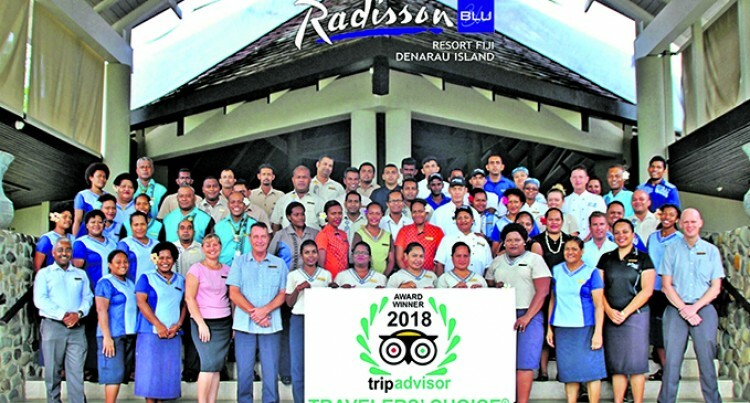 This is the third successive year that Denarau Island resort’s innovative ‘Yes I Can’ service philosophy has achieved the Number One Family Resort positioning for Fiji. The win was based on millions of reviews and opinions of credible travellers. The Radisson Blu Resort Fiji was also awarded positions in two other categories – Top 10 Luxury Hotels in Fiji and Top 5 Family Resorts in the South Pacific. A Traveller’s Choice award is a powerful benchmark in the industry being the world’s largest travel site and the Radisson Blu Resort Fiji was the proud winner in three separate categories. Surrounded by tropical beach, gardens and tranquil architecture, the resort takes great pride in the family friendly features, which includes Fiji’s only white water tunnel slide and four unique lagoon style swimming pools including an adult’s only pool. “It is wonderful news to be recognised and awarded by TripAdvisor for another year and I thank the team for their passion and unbeaten spirit. “At the Radisson Blu Resort Fiji we will work together not only to maintain the Number 1 Family spot in Fiji, but to improve our ratings in the South Pacific and in the world,” Mr Bendtsen said.